This past weekend was Mother’s Day, a special acknowledgment of that special woman in all of our lives – Mom. Mothers all around most likely received flowers, cards, breakfast in bed, a fancy brunch or lunch out, and a day free of laundry, cooking and cleaning. Maybe an hour or two of relaxing in the backyard with a book. But what do mothers really need? Many, even Christians, will settle for the list above. Maybe add love of family, a challenging and fulfilling job, good and dear friends, happiness and joy. One might have found a Mother’s Day card with the scripture verse “As is the mother, so is her daughter” to reflect thankfulness for the strong mother-daughter bond and the passing down of good experiences and love. That card would have missed the point. One would be well served to read all of Ezekiel chapter 16 to understand just what is going on here in context of this prophetic Old Testament book. It’s not just a happy, quaint verse; it’s in context of one of the most harshest rebukes of the people of Israel while they are in captivity in Babylon. 1. Loved by your Husband – (verses 1-8) Israel is being called out for their gross disobedience which led to their banishment from their homeland to Babylon by the brutal Babylonians. God reminds Israel how she was taken from nothing and symbolically made His bride. She was greatly loved and possessed and adored by God. Mothers, as wives, need to be loved and adored by their husbands. 2. Supported, Adorned and Honored by your Husband – (verses 9-14) Israel was well fed, dressed with fine clothes and adorned with gold and silver jewelry. Her splendor was widely known and her stature among the nations was as a queen. Mothers, as wives, are to be provided for and honored as bejeweled royalty by their husbands in their appearance and stature. 3. Humble, Loyal and True (verses 15-19) – Israel became disloyal, promiscuous and dishonoring to God and her privileged status. She exchanged her gifts and beauty for temporal satisfaction and hedonist practices with ungodly partners. Mothers, as wives, are to be loyal and honoring to their marriage and themselves. 4. Loving of their Children and Offspring (verses 20-22) – Israel had degraded to the point of practicing infanticide and offering child sacrifices as idols to the pagan gods of surrounding cultures. This practice was detestable to God. Mothers are to love their children as gifts from God. 5. Honors and Worships God (verses 23-29) – Israel built public altars and lofty shrines to worship other gods, even the gods of their enemies and ultimate destroyers. Israel was like a harlot in eyes of God. Mothers are to worship the one true God. 6. Behaves Righteously (verses 44-52) – Israel behaved badly and paid the consequences meted out by a holy and righteous God, who punishes them but also remembers His everlasting covenant and restores them (59-63). 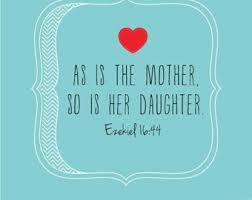 Mothers are to possess the Spirit of God and act noble and righteous in all behavior. A wife of noble character who can find? She is worth far more than rubies. Her husband has full confidence in her and lacks nothing of value. She brings him good, not harm, all the days of her life… She gets up while it is still dark; she provides food for her family and portions for her servant girls. She considers a field and buys it; out of her earnings she plants a vineyard. She sets about her work vigorously; her arms are strong for her tasks. She sees that her trading is profitable, and her lamp does not go out at night… She opens her arms to the poor and extends her hands to the needy. When it snows, she has no fear for her household; for all of them are clothed in scarlet. She makes coverings for her bed; she is clothed in fine linen and purple. Her husband is respected at the city gate, where he takes his seat among the elders of the land. She makes linen garments and sells them, and supplies the merchants with sashes. She is clothed with strength and dignity; she can laugh at the days to come. She speaks with wisdom, and faithful instruction is on her tongue. She watches over the affairs of her household and does not eat the bread of idleness. Her children arise and call her blessed; her husband also, and he praises her: “Many women do noble things, but you surpass them all.” Charm is deceptive, and beauty is fleeting; but a woman who fears the LORD is to be praised. This indeed is a woman of substance, a Mother worthy of honor on Mother’s Day and every day. Blessed is the boy/man who is raised by and then married to a woman/mother such as this: loved, honored, loyal, loving, Spirit-filled, and noble. And while we now know the true context, a mother like this can, in fact, be reflected positively in her daughter, making true the verse: as is the mother, so is the daughter. Are you appreciative of all that embodies a righteous woman/mother?